If we told you, the world would end -- right? Women want to feel safe and comfortable in their skins and in their surroundings. They want to feel free to express their unique personalities and styles. They want to feel free to express their sensuality and sexiness and celebrate their glorious bodies. They want to feel doted on and pampered. So that's the vibe and individually-tailored luxury boudoir experience we provide for our clients (and models). We give women what they want. Our studio is private, incredibly well lit, modern, clean and -- most importantly -- secure. You'll feel welcomed and right at home. 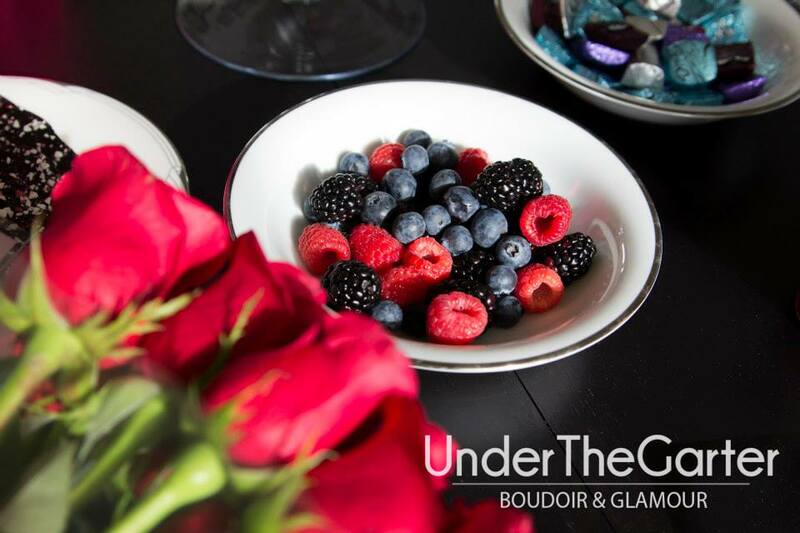 We'll feed you fresh berries and chocolates, bring you wine, bottled water or coffee. And our stylists will feel like your BFFs while they transform and personalize) your boudoir look and style. Melissa (da' boss!) will be with you every step of your session to make sure you look and feel like a supermodel -- all day. Speaking of personalized boudoir makeovers, our stylists are -- quite simply -- artists. In a recent model call, we just let them express their limitless creativity on our models. A model wanted a traditional smoky-eye and soft-curls boudoir look. Done! One requested a Gatsby makeover. BAM! One flawless Silent-film-era look! The last model (a 20-something dancer from LA) became a modern Marie Antoinette, complete with handmade songbird hairpins. Hair and makeup from Ally and Kaylee is pure badassery! We KNOW they'll create a makeover for you that's tailor made. Where was I? Oh yeah -- what women want. We like to think we know. Whether you're a model-call winner or a current or future client, you'll see that we know how to treat a lady. Come see for yourself!